"Pear tree" and "Pyrus" redirect here. For other uses, see Pear (disambiguation), Pear Tree (disambiguation), and Pyrus (disambiguation). The pear (/ˈpɛər/) tree and shrub are a species of genus Pyrus /ˈpaɪrəs/, in the family Rosaceae, bearing the pomaceous fruit of the same name. Several species of pear are valued for their edible fruit and juices while others are cultivated as trees. The word pear is probably from Germanic pera as a loanword of Vulgar Latin pira, the plural of pirum, akin to Greek apios (from Mycenaean ápisos), of Semitic origin (pirâ), meaning "fruit". The adjective pyriform or piriform means pear-shaped. The pear is native to coastal and mildly temperate regions of the Old World, from western Europe and north Africa east right across Asia. It is a medium-sized tree, reaching 10–17 metres (33–56 ft) tall, often with a tall, narrow crown; a few species are shrubby. The leaves are alternately arranged, simple, 2–12 centimetres (0.79–4.72 in) long, glossy green on some species, densely silvery-hairy in some others; leaf shape varies from broad oval to narrow lanceolate. Most pears are deciduous, but one or two species in southeast Asia are evergreen. Most are cold-hardy, withstanding temperatures between −25 °C (−13 °F) and −40 °C (−40 °F) in winter, except for the evergreen species, which only tolerate temperatures down to about −15 °C (5 °F). The flowers are white, rarely tinted yellow or pink, 2–4 centimetres (0.79–1.57 in) diameter, and have five petals. Like that of the related apple, the pear fruit is a pome, in most wild species 1–4 centimetres (0.39–1.57 in) diameter, but in some cultivated forms up to 18 centimetres (7.1 in) long and 8 centimetres (3.1 in) broad; the shape varies in most species from oblate or globose, to the classic pyriform 'pear-shape' of the European pear with an elongated basal portion and a bulbous end. The fruit is composed of the receptacle or upper end of the flower-stalk (the so-called calyx tube) greatly dilated. Enclosed within its cellular flesh is the true fruit: five 'cartilaginous' carpels, known colloquially as the "core". From the upper rim of the receptacle are given off the five sepals,[vague] the five petals, and the very numerous stamens. Pears and apples cannot always be distinguished by the form of the fruit; some pears look very much like some apples, e.g. the nashi pear. One major difference is that the flesh of pear fruit contains stone cells. Pear cultivation in cool temperate climates extends to the remotest antiquity, and there is evidence of its use as a food since prehistoric times. Many traces of it have been found in prehistoric pile dwellings around Lake Zurich. The word “pear”, or its equivalent, occurs in all the Celtic languages, while in Slavic and other dialects, differing appellations, still referring to the same thing, are found—a diversity and multiplicity of nomenclature which led Alphonse Pyramus de Candolle to infer a very ancient cultivation of the tree from the shores of the Caspian to those of the Atlantic. The pear was also cultivated by the Romans, who ate the fruits raw or cooked, just like apples. Pliny's Natural History recommended stewing them with honey and noted three dozen varieties. The Roman cookbook De re coquinaria has a recipe for a spiced, stewed-pear patina, or soufflé. 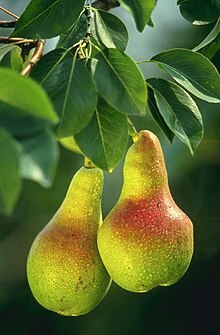 A certain race of pears, with white down on the undersurface of their leaves, is supposed to have originated from P. nivalis, and their fruit is chiefly used in France in the manufacture of perry (see also cider). Other small-fruited pears, distinguished by their early ripening and apple-like fruit, may be referred to as P. cordata, a species found wild in western France and southwestern England. Pears have been cultivated in China for approximately 3000 years. The genus is thought to have originated in present-day Western China in the foothills of the Tian Shan, a mountain range of Central Asia, and to have spread to the north and south along mountain chains, evolving into a diverse group of over 20 widely recognized primary species. The enormous number of varieties of the cultivated European pear (Pyrus communis subsp. communis), are without doubt derived from one or two wild subspecies (P. communis subsp. pyraster and P. communis subsp. caucasica), widely distributed throughout Europe, and sometimes forming part of the natural vegetation of the forests. Court accounts of Henry III of England record pears shipped from La Rochelle-Normande and presented to the King by the Sheriffs of the City of London. The French names of pears grown in English medieval gardens suggest that their reputation, at the least, was French; a favored variety in the accounts was named for Saint Rule or Regul', Bishop of Senlis. Asian species with medium to large edible fruit include P. pyrifolia, P. ussuriensis, P. × bretschneideri, P. × sinkiangensis, and P. pashia. Other small-fruited species are frequently used as rootstocks for the cultivated forms. Many varieties, such as the Nashi pear, are not "pear-shaped". According to Pear Bureau Northwest, about 3000 known varieties of pears are grown worldwide. The pear is normally propagated by grafting a selected variety onto a rootstock, which may be of a pear variety or quince. Quince rootstocks produce smaller trees, which is often desirable in commercial orchards or domestic gardens. For new varieties the flowers can be cross-bred to preserve or combine desirable traits. The fruit of the pear is produced on spurs, which appear on shoots more than one year old. Other species are used as rootstocks for European and Asian pears and as ornamental trees. Pear wood is close-grained and at least in the past was used as a specialized timber for fine furniture and making the blocks for woodcuts. The Manchurian or Ussurian Pear, Pyrus ussuriensis (which produces unpalatable fruit) has been crossed with Pyrus communis to breed hardier pear cultivars. The Bradford pear (Pyrus calleryana 'Bradford') in particular has become widespread in North America, and is used only as an ornamental tree, as well as a blight-resistant rootstock for Pyrus communis fruit orchards. The Willow-leaved pear (Pyrus salicifolia) is grown for its attractive, slender, densely silvery-hairy leaves. The purely decorative cultivar P. salicifolia ‘Pendula’, with pendulous branches and silvery leaves, has also won the award. Summer and autumn cultivars of Pyrus communis, being climacteric fruits, are gathered before they are fully ripe, while they are still green, but snap off when lifted. In the case of the 'Passe Crassane', long the favored winter pear in France, the crop is traditionally gathered at three different times: the first a fortnight or more before it is ripe, the second a week or ten days after that, and the third when fully ripe. The first gathering will come into eating last, and thus the season of the fruit may be considerably prolonged. Pears may be stored at room temperature until ripe. Pears are ripe when the flesh around the stem gives to gentle pressure. Ripe pears are optimally stored refrigerated, uncovered in a single layer, where they have a shelf life of 2 to 3 days. Pears are consumed fresh, canned, as juice, and dried. The juice can also be used in jellies and jams, usually in combination with other fruits, including berries. Fermented pear juice is called perry or pear cider and is made in a way that is similar to how cider is made from apples. Pears ripen at room temperature. They will ripen faster if placed next to bananas in a fruit bowl. Refrigeration will slow further ripening. 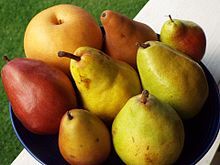 Pear Bureau Northwest offers tips on ripening and judging ripeness: Although the skin on Bartlett pears changes from green to yellow as they ripen, most varieties show little color change as they ripen. Because pears ripen from the inside out, the best way to judge ripeness is to "check the neck": apply gentle thumb pressure to the neck or stem end of the pear. If it yields to gentle pressure, then the pear is ripe, sweet, and juicy. If it is firm, leave the pear at room temperature and check the neck daily for ripeness. The culinary or cooking pear is green but dry and hard, and only edible after several hours of cooking. Two Dutch cultivars are "Gieser Wildeman [nl]" (a sweet variety) and "Saint Remy (pear) [nl]" (slightly sour). Pear wood is one of the preferred materials in the manufacture of high-quality woodwind instruments and furniture, and was used for making the carved blocks for woodcuts. It is also used for wood carving, and as a firewood to produce aromatic smoke for smoking meat or tobacco. Pear wood is valued for kitchen spoons, scoops and stirrers, as it does not contaminate food with color, flavor or smell, and resists warping and splintering despite repeated soaking and drying cycles. Lincoln describes it as "a fairly tough, very stable wood... (used for) carving... brushbacks, umbrella handles, measuring instruments such as set squares and T-squares... recorders... violin and guitar fingerboards and piano keys... decorative veneering." Pearwood is the favored wood for architect's rulers because it does not warp. It is similar to the wood of its relative, the apple tree (Malus domestica) and used for many of the same purposes. Raw pear is 84% water, 15% carbohydrates and contains negligible protein and fat (table). A pear in a 100 g serving (small pear) supplies 15 grams of carbohydrate, negligible fat and protein, and 57 Calories, while providing a moderate source of dietary fiber and no other essential nutrients in significant amounts (table, USDA National Nutrient Database). 'A Partridge in a Pear Tree' is the first gift in "The Twelve Days of Christmas" cumulative song. This verse is repeated twelve times in the song. The pear tree was an object of particular veneration (as was the Walnut) in the Tree worship of the Nakh peoples of the North Caucasus – see Vainakh mythology and see also Ingushetia – the best-known of the Vainakh peoples today being the Chechens of Chechnya in the Russian Federation. Pear and walnut trees were held to be the sacred abodes of beneficent spirits in pre-Islamic Chechen religion and, for this reason, it was forbidden to fell them. ^ Harper, Douglas. "pear". Online Etymology Dictionary. ^ The New Werner Twentieth Century Edition of the Encyclopaedia Britannica: A Standard Work of Reference in Art, Literature, Science, History, Geography, Commerce, Biography, Discovery and Invention. Werner Company. 1907. ^ Toussaint-Samat, Maguelonne (2009). A History of Food. John Wiley & Sons. p. 573. ISBN 978-1-4443-0514-2. ^ Grainger, Sally & Grocock, Christopher (2006). Apicius (with an introd. and an Engl. transl.). Blackawton, Totnes: Prospect Books. p. IV.2.35. ISBN 978-1-903018-13-2. ^ Silva, G. J.; Souza, Tatiane Medeiros; Barbieri, Rosa Lía; Costa de Oliveira, Antonio (2014). "Origin, Domestication, and Dispersing of Pear ( Pyrus spp.)". Advances in Agriculture. 2014: 1–8. doi:10.1155/2014/541097. ISSN 2356-654X. ^ Cecil, Evelyn (2006). A History of Gardening in England. Kessinger Publishing. pp. 35 ff. ISBN 978-1-4286-3680-4. ^ "Pear Varieties". Usapears.com. Retrieved 9 August 2014. ^ RHS Fruit, Harry Baker, ISBN 1-85732-905-8, pp100-101. ^ "RHS Plant Selector Pyrus communis 'Beth' (D) AGM / RHS Gardening". Apps.rhs.org.uk. Retrieved 14 March 2013. ^ "RHS Plantfinder - Pyrus communis 'Beurré Hardy'". Retrieved 23 September 2018. ^ "RHS Plantfinder - Pyrus communis 'Beurré Superfin'". Retrieved 23 September 2018. ^ "RHS Plant Selector Pyrus communis 'Concorde' PBR (D) AGM / RHS Gardening". Apps.rhs.org.uk. Retrieved 14 March 2013. ^ "RHS Plant Selector Pyrus communis 'Conference' (D) AGM / RHS Gardening". Apps.rhs.org.uk. Retrieved 14 March 2013. ^ "RHS Plantfinder - Pyrus communis 'Doyenne du Comice'". Retrieved 23 September 2018. ^ "RHS Plant Selector Pyrus communis 'Joséphine de Malines' (D) AGM / RHS Gardening". Apps.rhs.org.uk. Retrieved 14 March 2013. ^ "RHS Plantfinder - Pyrus salicifolia 'Pendula'". Retrieved 23 September 2018. ^ "Production of pears, 2016, Crops/Regions/World Regions/Production Quantity by pick lists". UN Food & Agriculture Organization, Statistics Division. 2017. Retrieved 6 July 2018. ^ Scott, Judy & Sugar, David (2011). "Pears can be ripened to perfection". extension.oregonstate.edu. Retrieved 30 August 2011. ^ "Pear Bureau Northwest". Usapears.org. Archived from the original on 10 May 2013. Retrieved 14 March 2013. ^ Koene, A. (2005). Food Shopper's Guide to Holland: A Comprehensive Review of the Finest Local and International Food Products in the Dutch Marketplace. Eburon Uitgeverij B.V. p. 79. ISBN 978-90-5972-092-3. ^ a b Lincoln, William (1986). World Woods in Color. Fresno, California, USA: Linden Publishing Co. Inc. pp. 33, 207. ISBN 0-941936-20-1. ^ The Chechens: A Handbook by Jaimoukha, Amjad. Published by Psychology Press 2005. ISBN 978-0-415-32328-4. Wikimedia Commons has media related to Pears.